Isn't it about time you knew the truth about Barack Obama? You won't — not until you've read The Amateur by Edward Klein. 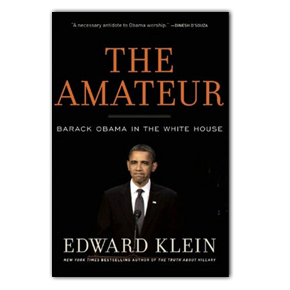 In The Amateur, Edward Klein exposes the ultimate amateur, President Barack Obama. And in this shocking exposÃ©, author Edward Klein also unveils one of the most clandestine White Houses in history. Donald Trump recently read The Amateur and calls it the best book on how 'amateur' Barack Obama is wrecking our country. He goes on to say that he urges every American to read The Amateur by Edward Klein if they care about the future of the United States. Edward Klein reveals the 'amateur' Obama, a man who misleads with arrogance. The Amateur is stuffed with eye-opening anecdotes and nearly 200 interviews, many of them with the insiders who know Barack Obama to be a true amateur. The result is the most significant political book of the year. Get The Amateur book by Edward Klein today and discover the truth!